Today was different from every other day. I went for a RUN yes a RUN well its not like I used to run but alas I did run. I went with my daughter, Lindsay, off road down along the river banks. Most people will not really know how good it felt as they are not runners themselves. We only went just over a mile but it was so enjoyable. The weather was cold and wet but that did not matter it was heaven to me. I did not ever think I would be able to do this again. Like I said in my last blog some people think I am stupid even trying to get back to any sort of sport. I don't agree. Running has always bean my release from every day life and I really miss it. Once I was asked when I would stop running (This was be for the fall that started the RSD) I said when I don't enjoy it. Fate had different ideas. You never know what you can achieve if you really want it so bad. 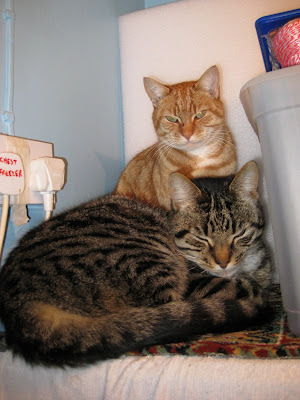 We have two cats that have taken over the shed lovely cats from two doors away. I went in to the shed to lock it and to put the cats out, Ginge was holding his head on one side and was falling over. I picked him up and cuddled him as he seemed to be in pain. I put him down and he fell over again. I thought he had suffered a stroke so I held him again for about twenty minutes. It was cold and I was shivering and shaking and crying at the same time convinced he was dieing. I shouted Andrew, lucky he was still awake and he came and looked at him not convinced it was a stroke. We left him in the shed with his brother hoping for the best. The next day he was no better but trying to walk Again I left him in the shed, but later he had gone, home I hoped. I put a note though Ness' (the cats owner) door to tell her what had happen. When she saw him she thought the same as I had - a stroke. After a vets visit he was diagnosed as having a really bad middle ear infection, after a steroid injection and bean given antibiotics the vet said he would be alright in a few days. I was so pleased. My running yesterday seams to have done no harm and I don't ache any more than usual. Pilate's today I got lift to the meeting place where I wait for Joanne it was snowing very fast, big flakes. I hoped she would be on time as it was very cold. As I waited with John the snow got heaver and thicker. John got a text message saying that she had got held up in traffic and would be a while. So we waited getting colder and colder, at last Joanne came we were on are way the snow was coming down very fast, so fast she was having trouble seeing to drive. At last we got there and the class started, we did the various exercises. When I did the one where you lay on your side and glide your arms from side to side (arm openings) my shoulder locked up and I could not move it. The pain was tremendous. I dare not move. Joanne came across and asked me what was wrong, I said I think my shoulder joint had moved out of place. She said what can I do I don't want to hurt you. Just pull it hard. she pulled my arm and held my shoulder it cracked and crunched loudly and went back in to place. The relief was so good. It still hurt but not as much as it did, more sore than pain. Thank you Joanne. The Snow on the way home was very thick and settled. Once home I took muscle relaxants and lots of pain killers, plus rubbing in tiger balm my whole body was stiff and spasming up. With a lot of pain in my bad foot. That is the weird thing with my RSD what ever I hurt, my foot always joins in with its pain. My shoulder is a lot better, no bad pain just feels sore. I feel very stiff but its physio tomorrow so Wietse will sort me out. Went to see Ness about Ging he is a lot better and going back to the vets tomorrow for a check up. I am so pleased. Wietse put needles in my head, ears, neck and shoulders they did not jump out like last time but they still hurt going into the muscles which are still very tight. I talked to him about my shoulder episode he said after the needles are removed he will massage them. He was very pleased that I have bean able to go for a run at last and coped very well. With the needles removed he set to work on my shoulders. He thinks I had a SUBLUXATION it means a partial dislocation as if I had a full dislocation it would have hurt more and Joanne would probably not have bean able to put it back into place with out medical help. I am so pleased it was not a full dislocation. He said it could happen again. When I first went into the shed today there was Ginge sat in his usual place he is still not back to full form but is much improved. My shoulders feel sore and my hips are stiff after sitting for a while. I have a job to walk but once I get going I am alright. My foot is painful at the side especially when I try to bend it. My temperature changes are no better. The tablets MELATONIN given to me for sleeping are no good and do not work for me, so I have stopped taking them.